Today there are motorized lifting systems available for most window covering products. These systems use a remote control and can be battery operated, hard-wired, low voltage, and can be integrated into new or existing home automation. Operating functions are served by a hand-held remote or other mobile device. Even when you’re away from home, window treatments may be operated remotely. 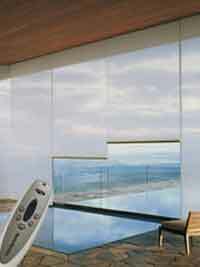 Basic limits of motorized window treatments are pre-set at the factory and various positions may be programmed.